Update, September 18: Epic have confirmed that Fortnite did indeed unintentionally have cross-play for a time, but it’s gone now. In a statement that’s been circulated to various outlets, Epic have confirmed that Fortnite players were able to play with one another for a time, but that this ‘feature’ was a mistake. “We had a configuration issue and it has now been corrected,” the Epic spokesperson says. Check out our full Fortnite guide for the best tips and tricks to get you started. The fact that it’s apparently so easy to accidentally turn on cross-play suggests that maybe it’s not so difficult a problem to solve, and that maybe it’s all the platform-holder politics holding people back from being able to play with their friends on different systems. In any case, keep trying to connect with console pals on Fortnite. The next patch to reinstate this particular bug could be coming any day. Original Story, September 18:Fortnite does not officially support cross-play. The FAQ on the official site reads, “Cross-platform play is not supported by Fortnite at this time.” Players are supposed to be able to share progression between their PS4 and PC accounts, but they aren’t supposed to be able to play with or against others on different platforms. Yet, somehow, people are breaking platform boundaries and playing the building shooter with just about anybody. A recent Reddit post shows an Xbox One and PS4 player teaming together, despite Sony’s recent dismissal of cross-play with Microsoft platforms. You can see something similar with the Twitch clip below. Apparently, PC players are in on the action, too. 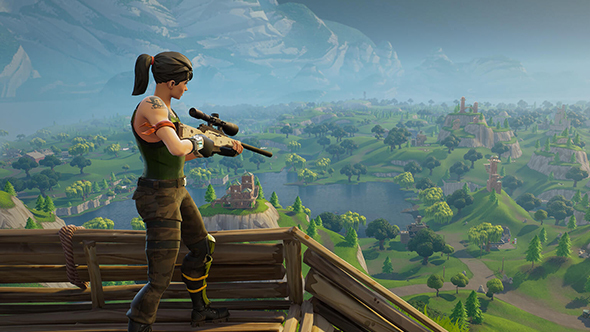 It’s unclear whether this is an actual feature, a newly-introduced bug, or simply a secret bit of how Fortnite servers work only made apparent by the increased player counts of the new Battle Royale mode. Varied reports from individual users have suggested that PS4 and PC cross-play has been working for some time, but this marks the first widespread report of Xbox One players being part of the action, too. PC players are often subject to the whims of console platform-holders in determining who they can play against, and it seems that Sony are the ones holding up the works these days. Games like Rocket League allow PC players to join either PS4 or Xbox One users, but never both at the same time.